Your Last Chance to Catch Amazing Wearable Tech @MFA Boston #WearableWednesday « Adafruit Industries – Makers, hackers, artists, designers and engineers! 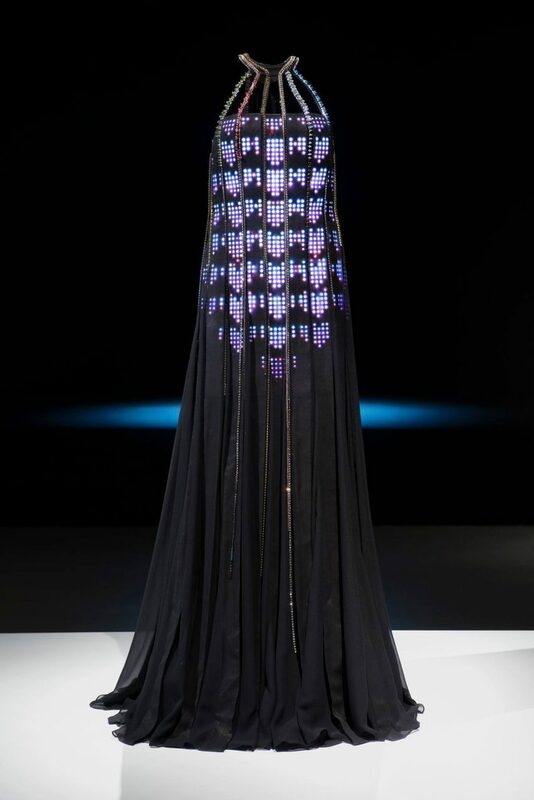 I’ve been hearing great things about the wearable tech exhibit at Museum of Fine Arts, Boston, but I finally got to see the amazing fashions when a friend sent me a slideshow from TechConnect. So, get ready for some of the best fashions in #Techstyle, and if you want to see it, you have until July 10th. 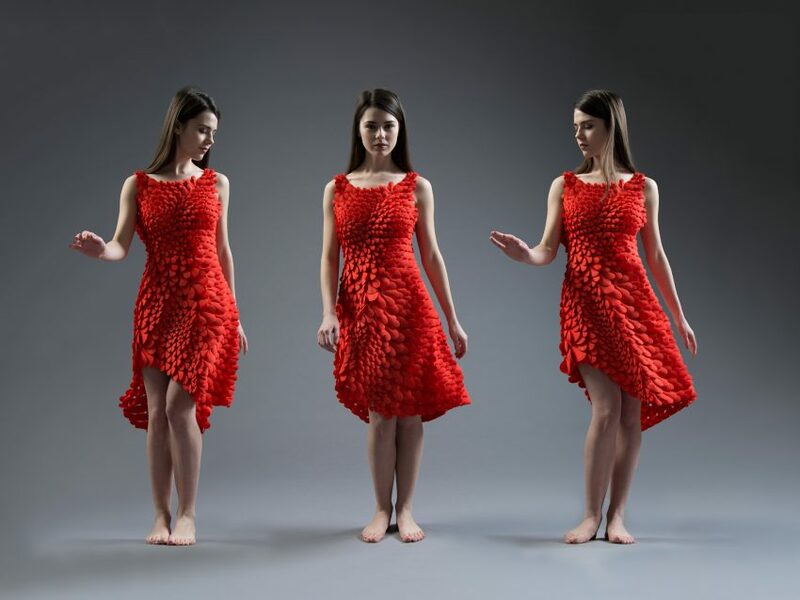 Starting off with this 3D printed spiral dress Harmonagraph, the designers threeASFOUR decided to embody the Fibonacci sequence. Originally harmonagraphs were created using pendulums, so it’s pretty sweet that this is being done digitally with stretch mesh. 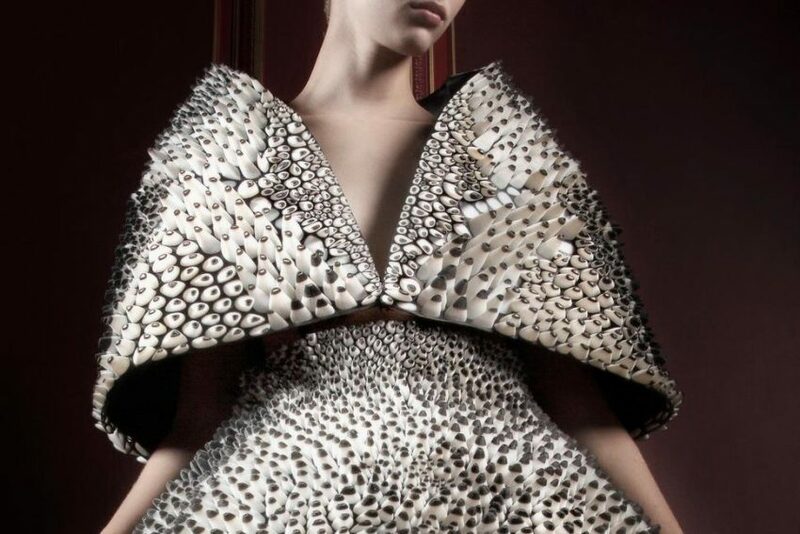 Another brilliant 3D print is this Anthozoa Cape and Skirt by Iris van Herpen. I can’t help but think this looks like a combination of organisms and certainly the name of the piece is a hint since it refers to a class of marine invertebrates (think sea anemones). This project is actually a collaboration with MIT’s Neri Oxman, who has previously done some great wearables looking at biology and the body. Materials for this piece include polyurethane rubber and acrylic co-polymer as well as twill and silk satin, making this an unusual combination. As you might guess, this gown is from Cute Circuit, with its adorable LED heart design. This project was a custom piece for the Museum of Fine Arts combining Cute Circuit’s fabric with dangling Swarovski crystals. If you visit the museum, you can actually use an Ipad to program the 11,000 micro LEDs to mimic famous art like Hokusai’s Great Wave. I love the flapper style gone wild and it’s perfect for a modern version of The Great Gatsby. I’ve seen Francis Bitonti’s Molecule Shoes before, but I never get tired of them. Filled with MineCraft like detail and a rainbow of colors, they steal the show wherever they go. 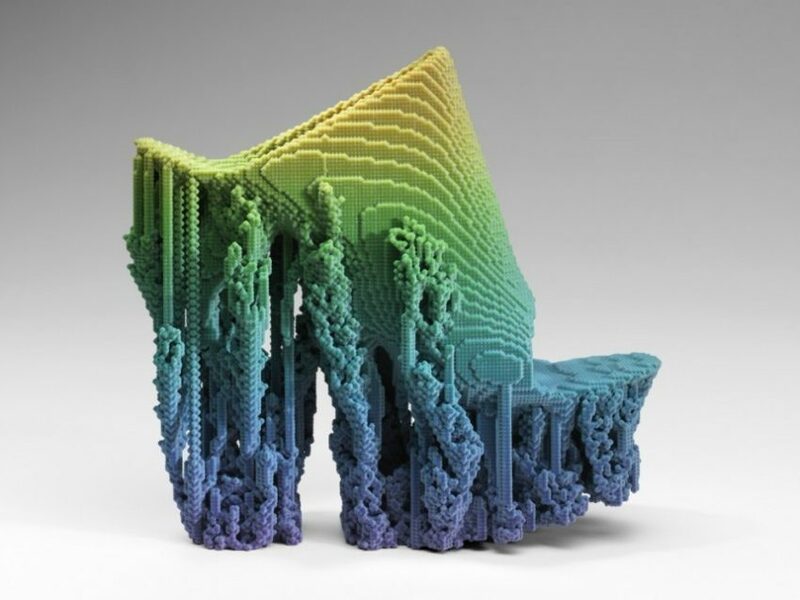 The secret ingredient in these 3D printed shoes is Conway’s “Game of Life” algorithm, giving an organic look to the structure. They are so beautiful that I can’t even imagine walking on them, and supposedly each pair is unique. 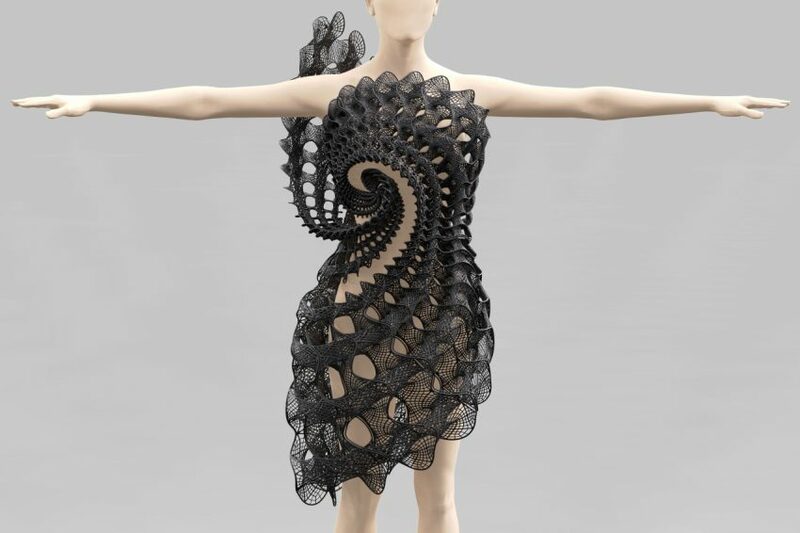 This Kinematics 8 Dress is inspired by petals, feathers and scales, but what’s unusual is that it’s ready-to-wear off the 3d printer, according to creators Jessica Rosenkrantz and Jesse Louis Rosenberg. The movement of the dress reminds me of a Scarlet Macaw shaking its red feathers, which I love. It’s the modern version of chainmail armor. 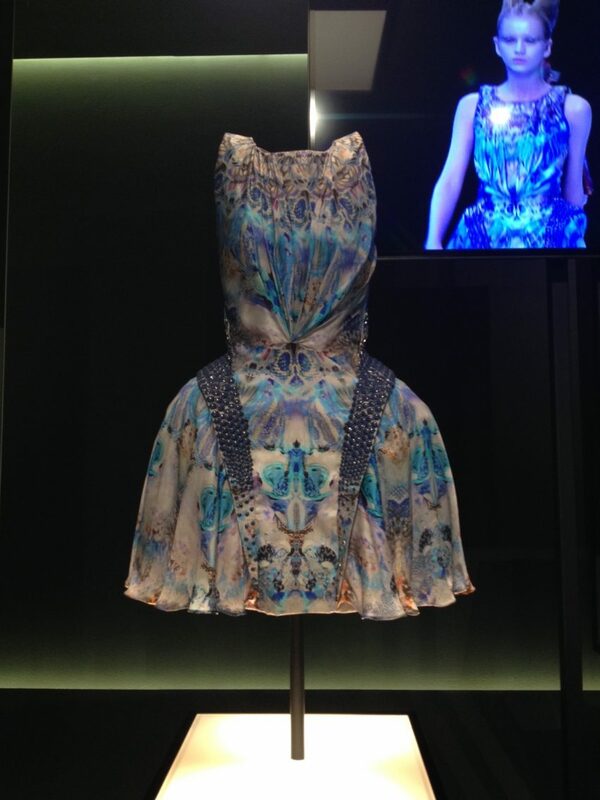 Breaking up the mix of 3D printing is this McQueen Dress, which utilizes digital printing on fabric for a special theme. Alexander McQueen created this piece for Plato’s Atlantis show in 2010 depicting “an apocalyptic ending of humankind returning to the sea.” McQueen was a designer for Givenchy and sadly passed away in 2010. Not only does he leave behind a legacy of imaginative fashions, but also some great quotes like, “Fashion should be a form of escapism, and not a form of imprisonment.” On that note, I hope you are inspired to catch a train to Boston, as well as inspired to make your own wearable tech. 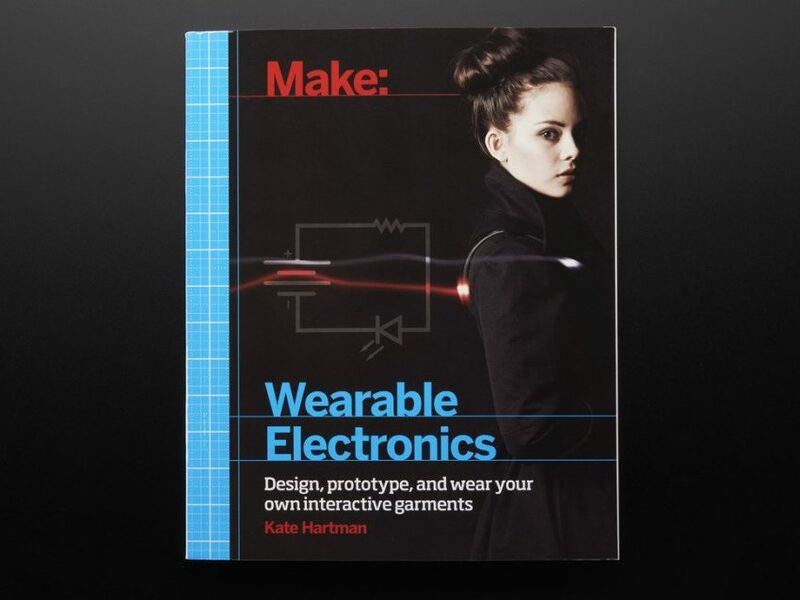 If you want to see the possibilities, check out the book in our shop Make: Wearable Electronics by Kate Hartman. You’ll learn about some great interactive projects and see fashion through Kate’s eyes as a form of non-verbal communication. Cool stuff!